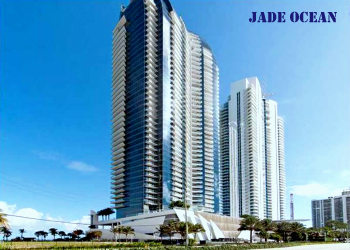 If you are looking for an oceanfront condominium that offers the best residential facilities and an opulent lifestyle, then Jade Ocean is the best choice. This luxury, beachfront condominium is located on the Sunny Isles Beach, directly on the Atlantic Ocean. This is one of the all-glass structure designed by one of the most foremost architects of our time – Carlos Ott. The soft, warm breeze of the Atlantic ocean, and the smooth, white sand of the Florida beach will certainly win your heart. The appearance of this condominium looks like fine art, a master peace design impresses every visitor and resident. The location of this condominium is such that all the major areas and attractions of Miami are just a few minutes’ drive away from this place. 17. The kitchens are decorated with granite countertops, imported cabinetry, glass cabinets, branded and modern kitchen appliances, etc. 18. The bathrooms are splendidly designed and decorated with European faucets and fixtures, large vanity mirrors, whirlpool tubs, etc. Many well-known real estate agencies are offering units in this magnificent condominium for sale; and if, you are interested in buying a unit in this luxury condominium, you can contact these real estate agencies. You may also visit their websites to know more about this beautiful, luxury condominium. Leon Bell is a licensed real estate consultant. She is one of the sharpest minds working in the Miami real estate market, something which numerous investors and buyers are glad for. She does a remarkable job of combining the analytic and emotional aspects of buying real estate, benefiting everyone involved. History of Sunny Isles Beach. “Florida’s Riviera”. History of Miami Beach (Then & Now).